That part of the mental makeup positioned inside to develop detailed plans is called the mind, and that part that carries out those plans, the spirit. The mind may be compared to the master, and the spirit to his servant. The mind says inside and uses the spirit. If the spirit becomes overworked, it may stumble. You must have the spirit tethered to the mind so that it may not be carried away. 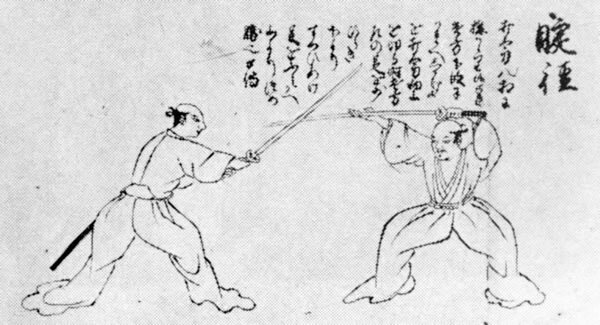 In swordsmanship terms, the firming up of your body below the waist may be said to be the mind, and the actual exchange of blows after the flight has begun, the spirit. Keep the spirit under the tight control of your body below the waist. Don't allow it to take an impetuous attack stance. It is vital to maintain calm by having the mind pull back the spirit and by not allowing it to be dragged along by the spirit.